About This Painting: The series goes on number five in my daily painting series of balancing objects. It was almost a year ago when I noticed a lady trying on a big floppy hat, it was a black one, there was something about the moment that stuck in my mind. I have thought about it of and on for a long time. I wanted to paint it but wasn't sure how to go about it. So today I gave it a try but I want a big red hat, that's the fun of being an artist you can make the hat any color you want. What color of hat do you like? This is a little pink splendor in a glass. Now if you want to know how to paint one get your martini glass out put mix you drink add the cherry and paint away. If the painting gets rough or just life in general take a little sip this too will pass. Enjoy life. Pink Martini with Cherry, Description of artwork This is a little splendor in a glass. Chinchilla fur is considered the softest in the world and is thirty times softer than human hair. Chinchillas must regularly bathe in dust or volcanic ash to remove oil and moisture that gathers in their thick fur. In fact, they have the highest fur density of any land animal. Their fur is so dense that skin parasites (such as fleas) cannot live on one lest they suffocate. Where humans grow one hair from each follicle, a chinchilla has more than fifty hairs from a single follicle. They make great pets and live about 15 years. It take about 200 chinchillas to make coat but only one to make a painting. It's raining again in Michigan but I am not complaining. It could be snow. Today I painted another oil painting in my balancing act series. I used my mouth wash,tooth paste, and dental floss. What will I balance next? About This Painting: Another vegetable painting in my roots series of organically grown kitchen art. Kitchen Art is a term I use for things I find in my kitchen to paint. I am not just speaking of the finished painting as a decor item. Kitchen art for me is the food and cooking items that are in my kitchen. Today it is pears and Apples. Oil painitng on canvas mounted on hardboard ready to frame. This painting is 8x6. 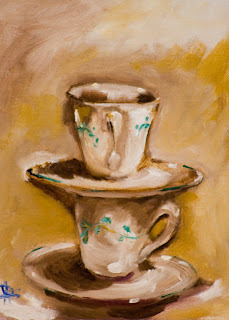 Balancing two cups and saucers in this oil painting. Gee what will I find to balance tomorrow. This oil painting of dishes is painted on canvas mounted on hardboard. The painting is 8x6 and is ready to frame. This is number 2 in my new balancing act series where I balance different objects on top of each other. About This Painting: This large floral painting is done in acrylics on watercolor paper. Red Pear still life painted in oils on gallery wrapped stretched canvas. Last night I was at meeting where the women there were discussing the issue of balancing their artist lives with their family and work. I go to think about all the things we balance and how paintings on the subject might be interesting so this is the first. 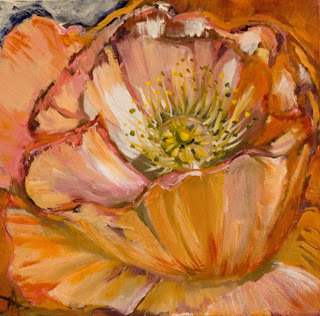 California Poppies make a dazzling display in a not so still still life painting. Original oil painting on gallery wrapped stretched canvas. The sides are painted and this work may be hung as is or framed. As you know I sometimes plein air paint for my daily painting. 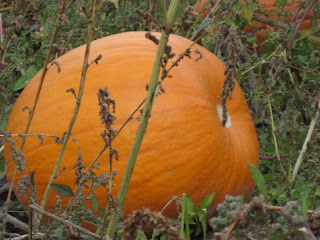 Yesterday I went out to a fruit farm about mile outside of a very small town in Napoleon Michigan. It was cold an over cast in the morning when I started and the ground was damp. I cut the fingers out of old gloves so my hands stay warm while I paint. I think my hands may have been the only thing warm. 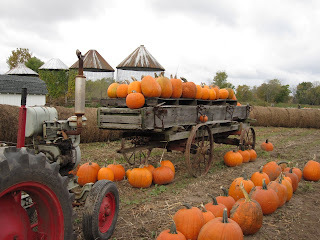 The Curtis fruit farm had so many interesting places to paint it was hard to decide, but I finally painted an old wagon that was full of pumpkins. This landscape painting was done "en plien air" yesterday at a Michigan fruit Farm. There are numerous types of hot peppers around the world with varying degrees of heat. The degree of a hot a pepper's heat is measured on a chart called the Scoville scale. Capsaicin, which causes the heat in a hot pepper, is found in the ribs of the pepper. I live in Michigan. By day I am an Artist but in my spare time I garden. I was raised on a farm so I have a love for nature and the land. I heard a quote once when I was a child we raised all we ate and we ate all we raised. I have add a new line I also paint it. A Few Hot Ones,Jalepeno Peppers another painting in my vegetable series. A mix of vegetables is the best start to a fall meal. Vegetables painted in oils on hard board. Large bold abstract floweral art painted in oil. This was not a daily painting but took a weeks to complete, it is on gallery wrapped stretched canvas with painted sides. oil on gallery wrapped stretched canvas. About This Painting: Daily painting of Rag doll, These best friends reminds me of my best friend Mythi. We give each other hugs and talk when we can now miles apart but still best friends. Here is a hug for all best friends. About This Painting: This daily painting of a single Rose and Bumble Bee is done in oil. I am readying a book on keeping bees and making honey so I have been put a few bees in my floral paintings lately. About This Painting: I painted a rooster like this in watercolor a few years ago. It now has a home in England. I had the hardest time finding the little noise maker toy for this painting. I wasn't sure what to call them. I'm still not sure if they have a correct name. The sides are painted and the back is wired, this painting can be hung as is or framed. I have a black cat his name is Sammy and he is 24 this year.